London 2012 was undoubtedly an Olympics to remember. With incredible sporting achievements backed by wholehearted support across the UK, heroes were made and stories written into the history of the Games. We’re delighted to say that Panasonic played a part in making the Games such a stunning spectacle. As an Official Worldwide Olympic Partner, our projectors and displays were central in bringing the games to the eyes of the world, from the Opening Ceremony to competition venues, and from broadcast studios to national pavilions. 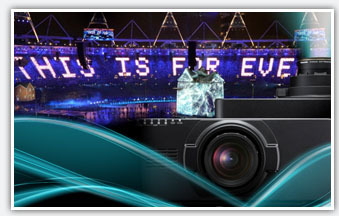 Key participants in the Games were Panasonic PT-DZ21K Series projectors, which helped to bring Danny Boyle’s vision to life at the Opening Ceremony – rated as one of the best ever. They were supported by stunning 3D theatre venues, professional plasma displays and cutting-edge broadcast equipment – you’ll find the full story of their involvement right here.